Whether it’s restaurants, nightclubs, spas, hotel rooms or tennis courts, subaquatic adventure is tourism’s fastest-growing frontier. Earth’s first all-glass undersea restaurant, Ithaa, is found at the Maldives’ opulent Conrad Rangali Island resort. Tube shaped, it’s a hotel-come-aquarium serving contemporary European dinners five metres below the Indian Ocean surface. Another subaquatic Maldivian dining option is SEA, a dimly lit, dark wood venue at Anantara Kihavah Villas. It's handily adjacent is the world’s only underwater wine cellar. Prefer the entire hotel to be underwater? Then there’s good news from Florida, where construction has begun on the Planet Ocean Underwater Hotel. Accessed via a sealed lift, its dozen rooms each contain clear acrylic walls and ceiling panels. The hotel will be mobile, but its opening location and date remain undecided. The Florida Keys already has one hotel below the Atlantic surface. But before they can book in, guests frequenting Jules’ Undersea Lodge in Key Largo must first scuba-dive 19 metres to its opening latch. Diving lessons are available, and rates include pizza-delivery dinners. Meanwhile, an artificial Floridian reef is hosting underwater art. Until August 2016, scuba-diving art fans can inspect photographs attached to the 523-foot Gen. Hoyt S. Vandenberg—a former Air Force missile-tracking ship—close to Key West. Austrian artist Andreas Franke says his large, plexiglass-encased images depict a flamboyant era of European style. Caribbean divers can enjoy modern art, too. Devised by marine sculptor Jason deCaires Taylor and hosting 65 of his pieces, the Grenada Underwater Sculpture Park is located in lovely Molinere Bay. Back in the Maldives, Subsix is reached via speedboat from the main Per Aquum Niyama resort, and then down a chandeliered staircase. Inside, you’ll find a clam-shaped bar, chains of pretty capiz shells hanging from the ceiling and colonnaded glass walls. The car hosts champagne breakfasts and ‘glow parties’. Far more sedate is Mexico’s Clear Lounge, a space which one visits for half an hour while wearing an oxygen helmet. Possible pastimes include posing in a photo booth or contesting games of Jenga. Another Per Aquum paradise in the Maldives boasts Earth’s only underwater spa. 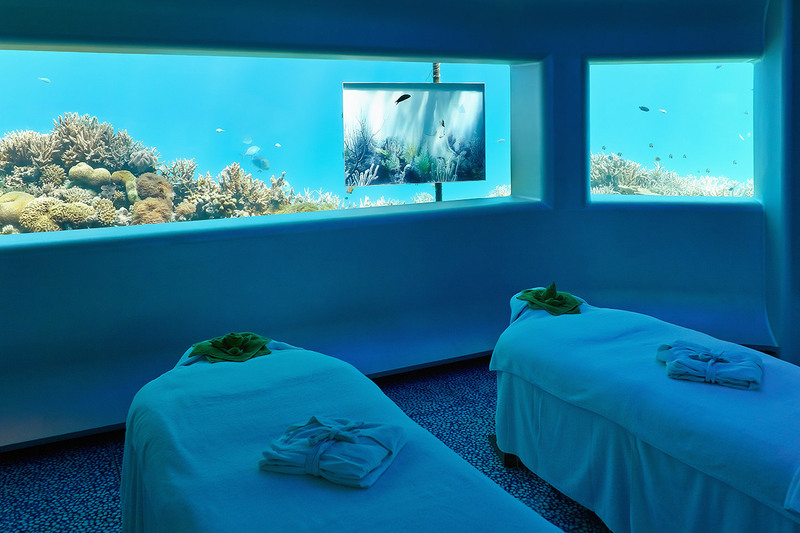 Part of Huvafen Fushi, LIME’s signature, three-hour treatment involves a massage using local coconuts, the application of melting ice cubes and time in a panoramic, below-the-surface relaxation pod. Bliss. Safaris are all about going overland, but you can finish yours under the sea. Part of blissful Zanzibar’s Manta Resort, the Underwater Room has an above-water deck for sunbathing purposes, but its sunken boudoir affords perfect privacy. Unless you count curious marine critters, no-one can spy on your bedroom antics. A boat is also used to get to Sweden’s Utter Inn, an art project on Lake Malaren, near Stockholm. From the red house and deck, guests descend to a small bedroom just below the surface via ladder. Dubai’s ultra-luxurious Atlantis the Palm resort has mooted a first-ever subterranean tennis complex. Roger Federer and Andre Agassi have already played a match atop the 321m Burj al-Arab. Designs for the complex show seven arenas built with clear roofs, allowing visitors to view rays and rabbitfish between rallies. Sending postcards from Vanuatu, a Pacific atoll west of Fiji, can be quite the experience for residents of Hideaway Island. The Underwater Post Office sits 9 feet underwater, you see. Waterproof cards can be sent from $3, and you know it's open for business when the float above contains a flag.